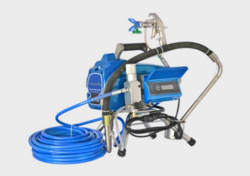 Offering you a complete choice of products which include airless sprayer, spray painting machine, airless spray painting equipment, wall putty sprayer, airless paint sprayer and paint sprayers. With our rich industry experience in this domain, we are introducing a comprehensive assortment of Airless Sprayer. be availed by our valuable customers in various specifications at industry leading prices. Keeping track of the latest market developments, we are introducing a precisely engineered range of Spray Painting Machine. In accordance with the concept of market standards, this painting equipment is designed utilizing the high-grade factor inputs and advanced technologies. The painting equipment offered by us is also checked under the direction of vendor’s quality experts to assure the flawlessness. Due to our proficiency in this domain, we are providing our clients with an extreme quality range of Airless Spray Painting Equipment. 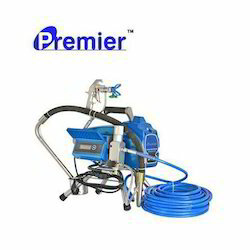 Premier introduces its latest range of airless Wall Putty Sprayer, cement sprayer and other range of paint sprayers, they reduce your labour cost, as each machine has the capacity to paint about 50,000 sqr feet daily. Our firm specializes in wholesaling, trading, importing, and supplying our prestigious clients with an impeccable array of Airless Paint Sprayer. Have a painting capacity of 40,000 to 50,000 Sq. feet per day & useful for painting huge volume areas, this paint sprayer is designed utilizing the high-grade factor inputs and advanced technologies. The paint sprayer offered by us is also checked under the direction of vendor’s quality experts to assure the flawlessness. Our organization specializes in wholesaling, trading, importing, and supplying a qualitative array of Paint Sprayers. The paint sprayer offered by us is designed using advanced technology in conformity with market standards and compliances. 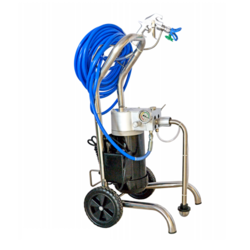 This paint sprayer is available in various sizes to fulfil the needs of our customers. 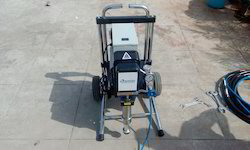 We also provide paint sprayer at affordable rates to our customers. 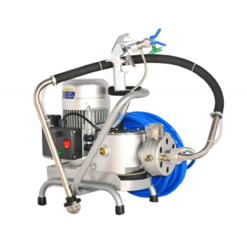 Our Industrial PP 6495 Airless Paint Sprayer is produced from brilliant crude materials. It is perfect for fluids of medium viscosities, first stages, completion paints and paints of medium thickness & molecule size. We likewise test our item according to predominating standard to guarantee that they are sheltered to utilize and sturdy. These are outfitted with pneumatically sensed superior air engines. 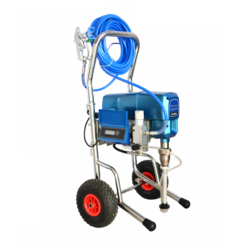 Looking for Airless Paint Sprayer ?